Bring a pot of water to boil (use enough water to cover the eggs when they lay in the bottom). When the water is boiling, turn off the heat and carefully add the eggs. Cover the pot and let it cook for 5 minutes (4 for super soft, 4:30 for soft, 5 or more for semi-soft yolks). 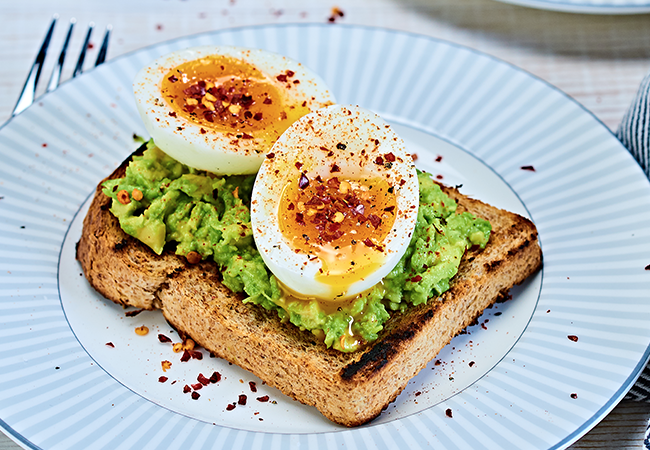 While the eggs are cooking, toast the bread and smash one avocado on each piece of toast. When the eggs are done, use a spatula to lift the eggs out of the water. After cooling them by rinsing them in cold water, peel them then place them on top of the toast. Sprinkle with salt, pepper, paprika or fresh herbs!